In the course of land recultivation of a shale mining area as part of a cement plant, not only agricultural land was restored but a new park was created. 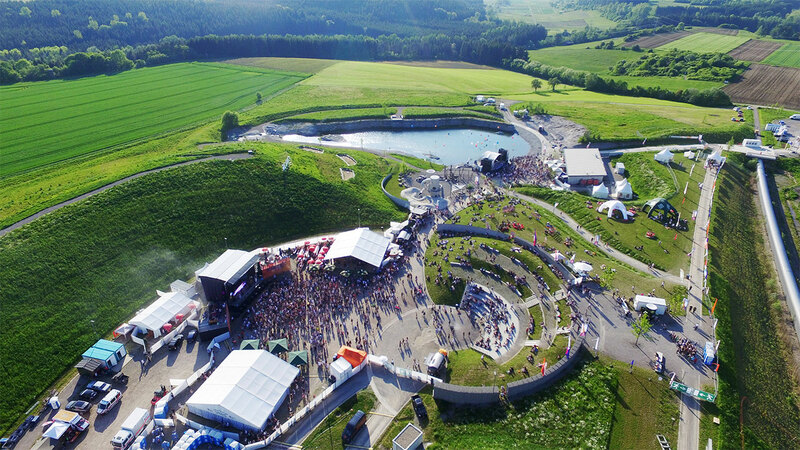 A 10-hectare area in the state of Baden-Wuerttemberg in the South of Germany was transformed into a park and outdoor event venue, adding sustainable value for the surrounding nature and the people of the municipalities Dormettingen and Dotternhausen. The main focus of the project was to represent the cultural and historical heritage of a landscape characterised by shale mining. There was a desire to preserve some of the structures created by the mining process (rugged edges, steep walls, quarry biotopes, etc.) on a permanent basis. The aim was to show how closely industrial history, geology, paleontology, biodiversity, man and nature are interlinked. The past and present use of the raw material shale and its special significance for the region was to be highlighted and made tangible for visitors. The former shale mine was not refilled to even out the ground, but the excavated landforms were enhanced. Generous earth modelling made the former mine accessible, resulting in a unique landscape park that offers its visitors a wide range of leisure activities. The fossil collection site (Knock-Plaza) beside the lake, forms the core of the park. An amphitheater with an open-air stage is an ideal place for concerts, festivals, theatre, open-air cinema and much more. The amphitheater answers to a need that the citizens of the municipality of Dormettingen have missed so far. A “mining playground” has been created for younger visitors. With the “play tower” and the “sound tower”, the design of the playground is based on the silhouette of the cement works visible in the background. Through the mighty tree trunks and boulders, it provides associations with the primeval world and invites the visitor to a creative, exploratory game. The visitor is lead through the park on an exhibition path, where information is revealed in creative ways: on one hand texts and figures on signs speak to the visitor’s intellect, while sculptural signs and hands-on activities invite the visitor to create a more emotional connection to the park. Thereby, the visitor is informed about topics such as geology and raw materials, fossils, the history of oil shale mining and cement production, the importance of water. The emphasis on ecology and integrated design runs through all areas of the park. This also applies to the water system and its playful water elements. The water of the 5000 square meter lake is treated in soil filters; rainwater is collected from the park to replenish the lake, as well as the operation of a water playground.